It’s the second semifinals on”America’s Got Talent” with twelve acts where only six more will continue. The show continue its “Final Save” this week which allows viewers to vote to save their favorite act among the acts with the least amount of votes. 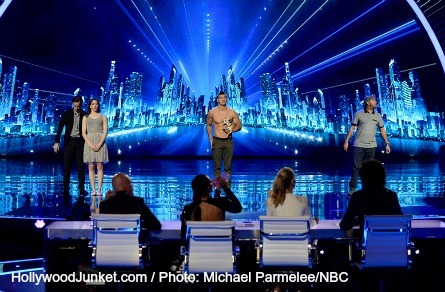 America’s Got Talent Season 9 Episode 20 and Episode 21 featureing; Kelli Glover, Emil & Dariel, Mat Franco, Jaycob Curlee, Quintavious Johnson, Jonah Smith, Wendy Liebman, AcroArmy, Blue Journey, Smoothini, Baila Conmigo and Christian Stoinev. How To Open A Show! Johna performed “Love Runs Out” by One Republic with a classic spin. Mel B yelled “yes, that’s how you open up a show! You bring it. You sound amazing and you delivered and you’re so entertaining!” Howie said he agreed “what a way to open-up a show.” Then gave them a back-handed compliment by telling them they are the best act of the night! (they were the very first act of the night). Heidi really liked them, stating – “I hope your love won’t be running out anytime soon.” Howard told Jonah he’s his favorite male singer. He asked him “is this your best performance?” He said he doesn’t think so, and that his performance should have been good enough to close a show, and he didn’t think it was. Hard NOT To Be Excited! He said when he went back home after his last performance, he just practiced and practiced. Jaycob sang “Your Song” by Elton John. Howard told him he rose to the occasion and said it was a “smart song choice” and his best yet. Heidi said it was a “small” song for him and told him he doesn’t have much of a stage presence. Mel B said America would like him more than that song he just performed. Howie told Jaycob “It’s about where you are now…maybe you spoke to them (America).” We will find out in The Results show. Howard said he brought back Wendy because “every once in a while, someone gets shorted.” He said Wendy is so funny. Howard also told everyone that “when she was voted-off, I gasped!” After her performance, Howard said, “It’s such a tough show for comedians. I hope America appreciates that she brought her A-game tonight. Heidi also liked Wendy, saying her comedy material “is relateable and she directs the audience. “You’re really, really funny.” Mel B said I just love a really strong, independent funny woman, and thanked Howard for bringing her back. Howie was on his feet for her. “You hone each word, you write the material. That’s harder than any other form of entertainment on here tonight. You won the crowd and you were funny,” he said. Sometimes The Risk Pays Off! Blue Journey performed probably their best act yet to Radio Head with animated looking silks and visuals. Heidi was impressed, “You were like a Dali painting coming to life. Definitely one of my favorite acts of the night.” Mel B. equally loved it and said they should stay! “The amount of creativity that went into that was amazing. You are so unique,” she told them. Howard said it was a little “sleepy”, and “only one act should win $1 million. Really stunning and risky doing it to such a slow routine.” He said sometimes risk pays off sometimes it back-fires.” Howie called it “a mash-up” and “it’s great, fantastic, amazing all in one” and urged America to vote. Paul McCartney Would Be Proud! Their dream is to play like the big lead guitarists in big stadiums, only with cellos. 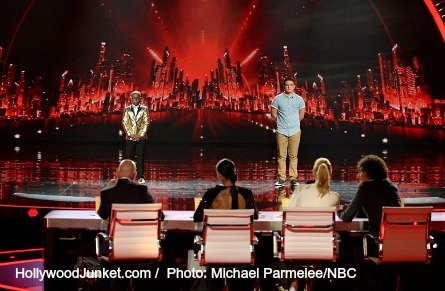 AGT is one step in making that dream a reality. They played James Bond theme song “Live and Let Die” by Paul McCartney and Wings on their cellos. They got a standing ovation. Mel B said “You come out here and you just smash it! It sounds amazing” and called the band “hot!” Howie said “you two are perfect, but felt like Paul McCartney didn’t show up.” Howard agreed with Howie, “why not bring a singer with you? You’re kind of waiting for Paul to show-up” Heidi said most proud is their Grandpa, and Paul McCartney would be proud, and Axel Rose would be proud. Christian kept with the theme of having his dog Scooby balance on his feet as did his usual hand-balancing act – this time to a Top Gun theme. He brought new dog out at the end of his act named “Scooby 2”. The judges were not impressed. Mel B said, “I do feel tonight, you did two hand-balancing acts. Towards the end it fell flat,” and she wanted more. Heidi said “more Scooby,” and her kids love his act. Howard said Christian is a front-runner, and it made him relax. “This was not your best night. If you should go through by some miracle, you have to go back to what made you incredible,” said Howard. Howie said he had confidence, and owned it. He said it became more about his dog than his strength. Christian replied to the judges comments by saying with his skill, it’s hard to learn something new fast. Name and Talent To Match! 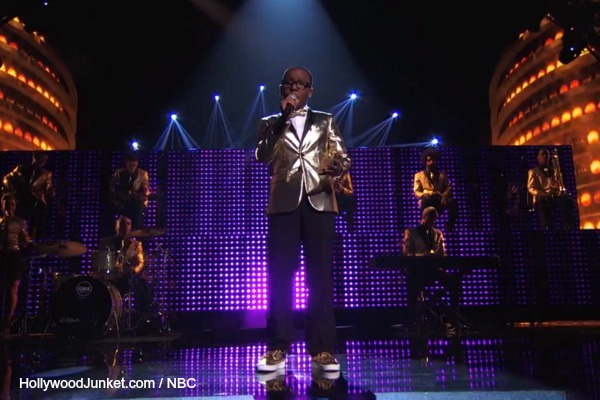 It’s the final night of “America’s Got Talent’s” Semifinals where six more act will round-off the Top 12. So far, acts that are continuing on in the competition are: Mike Super, Sons of Serendip, Emily West, Miguel Dakota, Mara Justine, David and Leeman. 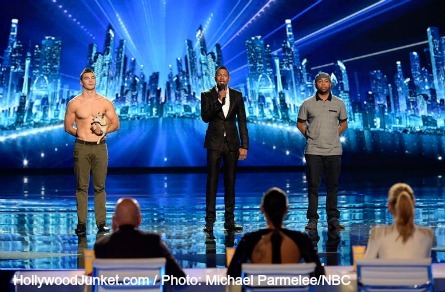 The acts who performed on Tuesday’s show who received the highest amount of votes from America and entering into the Top 12 AGT competition are: Mat Franco, Quintavious Johnson, Emil and Dariel and Acro Army. The bottom three acts who relied on the “Snapple Save Vote” were Blue Journey, Smoothini, and Christian Stoinev. Th America’s Snapple Save Vote went to Blue Journey! NEXT WEEK: America’s Got Talent will welcome The Muppets. The acts performing next week will be the Top 12 – Mara Justine, David and Leeman, Mike Super, Son of Serendip, Miguel Dakota, Emily West, Emil and Dariel, Mat Franco, Quintavious Johnson, AcroArmy, Blue Journey, and Christian Stoinev.